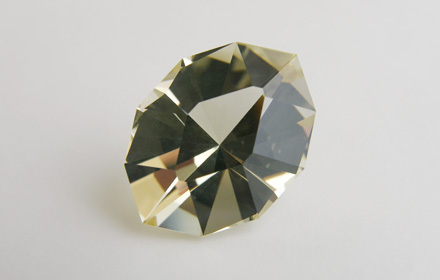 Weight: 5.90 ct; size: 15.61 | 11.31 | 8.52 mm; shape: oval; colour: light yellow; strong; clarity: eye clean; cut: excellent; treatment: none. Very clean specimen; design ‘Tessellation 33 (E)’ [deeper table] by Arya Akhavan, excellent cut by Tan Pen. A variety of albite; plagioclase feldspar with an albite:anorthite molar ratio ranging from 50:50 to 70:30.